An Abertay University 3rd year BA (Hons) Management student has just completed a 10 week placement with Gowrie Care. Alex Auld was tasked with supporting the development of a business plan to improve the services Gowrie Care provides through their Hubs facility. Clare McNally, Gowrie Care’s fundraising and grants officer and supervisor of Alex during her placement, explained that “Our Hubs facility is a fantastic resource for Gowrie and one we want to see grow. Relying mainly on external funding the Hubs offer drama groups, cooking classes, crafts activities and other added value services to the people we support. Shona Grogan, lecturer in business and management at Abertay, commented that “Student work placements are invaluable as part of any degree programme as they enhance students’ awareness of the reality of the workplace and improves their employability skills – all of which gives them an edge in a highly competitive job market”. 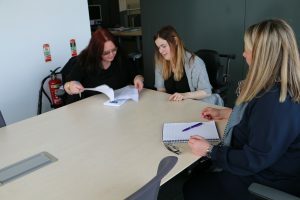 Alex Auld gave feedback on her placement saying that “My role within the project team gave me the opportunity to participate in several different aspects of the tasks required. It challenged my knowledge and abilities by requiring me to work with all members of the project team and due to the fact that this is a current and ongoing project for the organisation gave me a sense that I was doing something worthwhile and contributing to making a difference to real people’s lives.